While I don’t always alliterate, all 7 of these start with P to help us remember. The beauty of social media is that we have real time notice of real time needs and we can pray in real time. If your feed is like mine, on any given day I see friends post a variety of prayers requests. First, know that nothing compels us to pray for each one. But when the Spirit moves us to pray, rather than responding with the prayer-hand emoji and scrolling on, we can stop and lift up that person and that need right then and there. 2. Put prayer on the calendar. When someone mentions she’ll have surgery on a particular date or asks for prayer for an upcoming interview, it’s easy to forget to pray. I’m so glad we have calendars on our phones! We can put the date and prayer request on our mobile calendar. The notification will remind us not only to pray, but to follow up later. We can even calendar annual reminders to pray for someone on a significant day – a gotcha day, the date of diagnosis or the day someone died. 3. Pray for pint-sized needs. 4. Pray for the practical. God is so practical. I’ve learned this over the last 7 years of being a widow and single mom, as I’ve desperately needed practical help. Days after Dan died, I had to make a hard phone call. I was nervous about what to say and how it would go and when I prayed? God literally ordered my thoughts and what I would say. I dialed the number and the conversation could not have gone better. As I’ve prayed over needs, God has brought the name of someone who could help. He’s given clear direction on decisions I would have decided differently. You ask me how I know He lives? Because He is so much more than an idea or a pie-in-the-sky-platitude. God practically answers prayer. I saw it again this morning! 5. Pray the promises of God. Praying scripture has broadened and deepened my prayers. It takes our Bible study and morning devotional even deeper as we turn what we’ve read into a personal prayer. Praying scripture uses the words of a Bible verse or a Bible passage to guide our prayer. The entire book of Psalms is a prayer book! Praying the Word keeps our mind from wandering, anchors our prayer in God’s truth and helps us pray the will of God. 6. Pray when God prompts. Truth is, our instinct is to phone a friend. When we’re burning with indecision or fuming with outrage, our initial reaction is to go to someone who will tell us what we want to hear. We want immediate feedback or the emotional affirmation that comes with venting. Instead, we need to pray before we tell. God promises to guide us and give us wisdom. He has insight not even a spouse can have. Our prayer life will be strengthened as we learn to go to God first. If you’d like to get encouragement right in your inbox, subscribe here and I’ll send you my FREE 100 Days with Christ Bible reading plan and journal. I so needed your post today. Your writings are so easy to grasp – I well up with tears in having found your site. I thank our wonderful Lord for you. Have a blessed day. Thank you, I have been struggling with my pray life thinking I needed more, but this helped me to know I am working at it right. What a blessing. Yet again I see how God moves in our lives. I stumbled onto you through Pintrest and you have helped me see things more clearly. I needed this. I have been lacking in my prayer life, and this is the boost I needed! Thanks and blessings to you and your family. I really appreciated reading your letter today. I lost my husband of 52 years September 2018. Today I was having a really bad morning that got even worse when the technician told me I needed a new air & cooling system. Your letter on prayer lifted me up. May God continue to bless you. 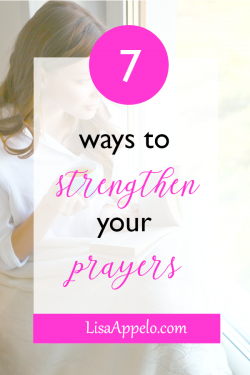 Thank you so much, I have been struggling in my prayer life too, but after reading your article on 7 ways to strengthen your prayer life, I see I am on the the right path. I truly was blessed by your 7 ways of strengthening our prayer life, I often feel that my prayer life needs more work. Thank you for your guidance. This is wonderful, and will help with my prayer life. Thank you! Thank you sweet friend! Great reminders! Pray for the practical – and pray before prattle! Those two were just for me! Thanks for the wisdom! !